Canine hypothyroidism can cause your dog to gain unwanted weight for no apparent reason. If your dog has put on weight, even without a change in diet, he may be suffering from hypothyroidism. In other words, your dog may have an under active thyroid gland. Hypothyroidism is a condition in which the thyroid gland secretes insufficient amounts of thyroid hormone. Thyroid glands are located on either side of the windpipe. The thyroid hormone has a direct bearing on the metabolic rate. Though the disease is not life threatening, it greatly diminishes the quality of life. Mid to large sized dogs between the ages of 4 to 10 years are more prone to this condition. 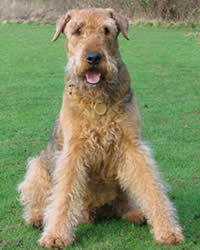 Some of the breeds that are more susceptible include the Golden Retriever, Irish setter, Miniature Schnauzer, Cocker Spaniel, Doberman Pinscher and Airedale Terrier. As with many dog diseases, the exact causes of hypothyroidism are not understood. However, it has been seen that in many cases hypothyroidism occurs when the dog’s immune system attacks its own thyroid gland tissues. This condition is known as autoimmune thyroiditis. Many cases of hypothyroidism are also caused by atrophy of the thyroid tissue, as a result of which the thyroid tissue is infiltrated by fat. And this leads to the reduction in thyroid hormone. The good news is that hypothyroidism is treatable, but you must first take your dog to the veterinarian for proper diagnosis. There are several tests that help in determining whether your dog has this canine illness or not. The Baseline T4 Test checks for the presence of T4 hormone. A dog with hypothyroidism will have a lower level of T4 hormone. The Baseline T3 Test checks for T3 hormone. Since this test does not offer an accurate prediction in early cases, it is often used in combination with the T4 test. TSH Stimulation Test: This test is a definitive diagnosis of hypothyroidism. A dog with hypothyroidism is typically put on a daily dose of thyroxine, a synthetic thyroid hormone. The amount given depends on the severity of the condition, weight and how the dog responds to treatment. Your veterinarian will closely monitor the condition of your dog in the initial stages of treatment to ensure he is receiving the proper amount, including follow-up testing. It has been noted that roughly 90% of canine hypothyroidism cases develop when the canine’s immune system weakens and attacks its own thyroid tissues. That’s why it is so important to work with your veterinarian to maintain your dog’s immune system and overall health, as well as helping to avoid or control other dog diseases. There also exist some all-natural supplements like Thyroid Support Silver or Thyroid Support Gold that are designed to give your canine nourishing and restorative support for thyroid function. In many cases thyroid disease is also genetic. Consequently, there may not be much you can do to prevent it. However, by keeping a close watch on your dog’s health you will notice the first signs of this condition and ensure that timely medical treatment is received. Timely treatment will greatly improve the quality of your furry friend’s life.